Tasks inherit their type based on the project. If the project is set to time and materials, by default the task will be time based. If the project is set to flat rate, the task type isn’t relevant, because a flat rate project cost is independent from tasks, so tasks are marked as non-billable by default. If the project is non billable, the task will be non billable as well. You can change the type of tasks only for time and materials projects, that means you can have a time and materials project and have time based, flat rate and non billable tasks in the same project. In order to have flat rate tasks, you need to set the project to time and materials, set the billing priority to tasks and then change the task type to flat rate. 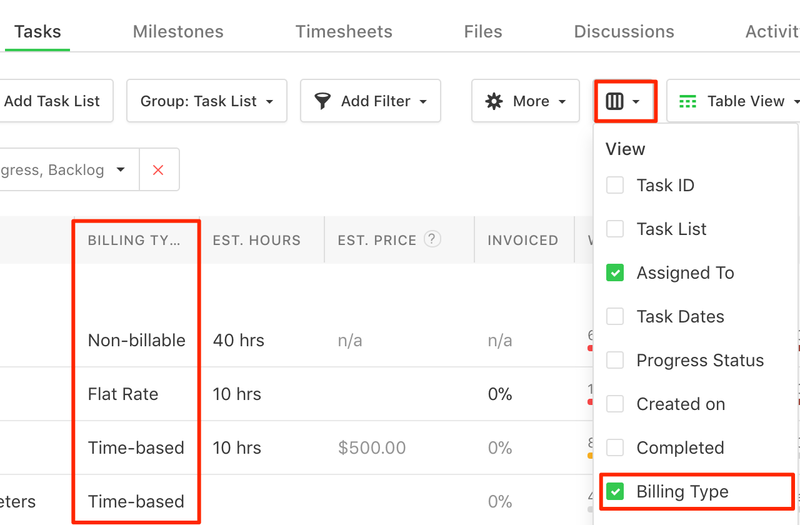 To change the task type you can either hover over the task in Simple view → full task details and change the billing type or if you’re in Table view, you can change it from the billing type column.